Male L 12″ (31 cm) Female L 10″ (25 cm). 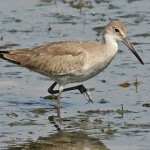 Description: Long necked, small head, plump body, medium length slightly decurved bill, white underwings, and long yellow legs. 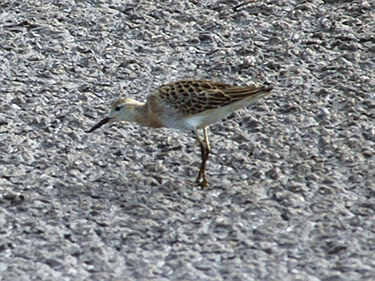 All plumages show a distinctive U-shaped white band on rump that is visible in flight. Breeding males show a gaudy ruff that ranges in color from black to rufous to white; black back, breast, and flanks; and white belly. Female (called a Reeve) lacks ruff; has mottled brown back; brown head, throat, and breast barred with black. Juvenile is brown above and buffy below with light streaking on crown. 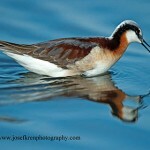 Habitat: Migrants can be found on grasslands and freshwater shorelines. Where in Nebraska: Seen near Axtell, Kearney County in September 1991, and in Phelps County during April 1995. A rare casual spring and fall migrant east and central Nebraska. Status: Old World species that wanders throughout North America. 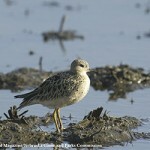 Fun Facts: Ruffs use a lek mating system where the male dances and puffs out the feathers around his neck, called a ruff.